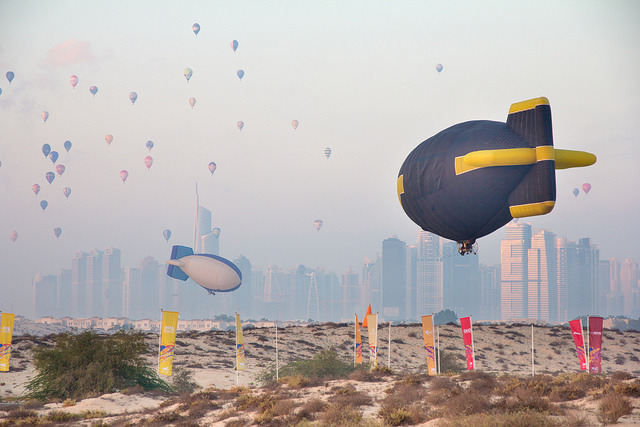 Like a cross between a giant bouncy castle and a dinosaur, airships are one of the least well-known craft taking to the skies here at the FAI World Air Games in Dubai. There are only four of these specialised aircraft competing, and you have to be up early to catch them. Lithuania, Russia, Poland and Sweden are all taking part. This morning as the sun rose above airship racing venue the Jebal Ali Racecourse, deputy event director Gary Lockyer explained the sport. “Airships are blimp shaped, which makes them more aerodynamic than balloons, and the pilot sits in an airship cart, not a basket or gondola,” he said. “Like a hot air balloon you pump in cold air first. Unlike a hot air balloon, the envelope is under pressure, but the air inside is heated by propane gas burners just like a balloon. The effect to the observer can be conflicting. With a blast of orange and the familiar roar of propane gas the graceful envelope inflates and starts to rise, but below it an engine rattles away noisily while the propeller providing the thrust adds a piercing whine. “Watch the prop,” quickly becomes a familiar refrain. Behind us, almost 50 hot air balloons float silently over the city skyline on an early morning training flight. In front of us, the airships are slowly pushing forwards, nose down, sometimes no more than three metres from the ground. Taking advantage of the first light of the day and the stillest air possible, the four pilots competed on three tasks this morning. The first was a pylon race – two laps of a 4km circuit. The second was the line task, where pilots have to navigate through a pair of blow-up pylon start gates then have four minutes to complete four tasks low to the ground. First drop a marker onto a target (in today’s case an inflatable paddling pool); then pick up a bottle of water from a high table; next put the bottle back down on another table; and finally drop a second marker onto another target before passing through a second set of gates. Float in too high to pick up the bottle or too low and take out the table, as one competitor did, and your score suffers. The third task was called ‘Mixed Salad’ and involved a touch-and-go and target landing. The whole event takes about 90 minutes and is over by breakfast time.